The months leading up to the Chinese leadership’s five-yearly political reshuffle are the most intriguing for observers of elite Chinese politics. Chinese officials get promoted or shunted out of key positions. News—mostly half-truth, half-speculation—of horse-trading between Communist Party political factions start surfacing in Hong Kong and overseas Chinese language media. As summer draws to a close, Party elites closet themselves away at a secretive sea-side resort to drive final bargains and concessions, and the results are actualized come the Party’s National Congress in October or November. Two high-profile incidents in January 2017 have convinced an outspoken, retired Chinese defense official that significant political action could come far earlier than the fall. Xin Ziling, the former director of the editorial desk at the People’s Liberation Army’s National Defense University, predicts that important measures will take place around the Chinese regime’s first key political meeting in March. In an interview with Epoch Times, Xin also shared his thoughts about missing Chinese businessman Xiao Jianhua, as well as the controversial comments by the regime’s top judge, and the Chinese judiciary’s reaffirmation of the regime’s persecution of the spiritual discipline Falun Gong, one of the largest ongoing political campaigns in China. The Chinese judiciary and the regime’s political and legal apparatus are frantically opposing Chinese leader Xi Jinping, Xin said, giving two examples. “Xi Jinping had indicated clearly how he wanted the Lei Yang case to be handed: Openly and fairly,” Xin said. In 2016, the death of Lei Yang, a Chinese environmentalist who was wrongly arrested and abused by five Beijing police officers, captured the attention of an enraged public. Although Xi publicly called for a transparent administration of justice for Lei Yang, according to his remarks reported by People’s Daily on May 21 last year, the five police officers escaped charges. The Chinese judiciary’s failure to prosecute angered the public. But the Lei Yang incident also tipped the hand of the political and legal apparatus, Xin Ziling said. Officials in the apparatus “worked together to resist Xi Jinping and Wang Qishan” the anti-corruption chief. Xin said that the Chinese judiciary also sought to trip up Xi Jinping in January by releasing an update to an anti-Falun Gong legal interpretation. The update, the first since a 2002 revision, seemed to suggest that the Xi Jinping administration is continuing the persecution campaign started by former Chinese leader Jiang Zemin in 1999. However, Xin believes the actual circumstances to be otherwise. “In convening a conference on religion, Xi Jinping has indicated his stance on Falun Gong very clearly to the Party elites,” Xin said. Near the anniversary of a key date associated with the persecution of Falun Gong in April, Xi held a high-level meeting on religion where he signaled that the Party would adopt a gentler approach in handling religious groups. So the Chinese judiciary’s updated interpretation on Falun Gong shows their opposition to Xi, and that they “still wish to follow Jiang Zemin’s way; Xi Jinping’s new decision and interpretation hasn’t been taken into account,” Xin said. Xin Ziling believes that the Chinese judiciary is sticking to Jiang’s mandate because their top leaders fear recrimination. “Xi Jinping wants all legal cases and suits acknowledged, and there are now over 200,000 criminal complaints against Jiang Zemin” awaiting processing in the Supreme People’s Court and the Supreme People’s Procuratorate, Xin said. And if the cases are processed, Jiang and his acolytes in the Chinese judiciary and political and legal apparatus, being key persecutors, face charges of crimes against humanity. “So to protect themselves, they’ve embarked on this final, frantic counterattack,” Xin added. If Xi Jinping backs down from the judiciary’s challenge, he stands to lose the faith of the Chinese people and his political prestige, Xin Ziling said. Given that Xi is being pushed to make a stand, Xin predicts that “there will be big activity before the Two Sessions; there’s a very good possibility that the opposing camp will be dealt a blow, and the Chinese people will be given something to cheer.” The Two Sessions, or “lianghui,” is a key political meeting in early March involving the 3,000 odd members of the Chinese regime’s rubber stamp legislature and political advisory body. “There will be a change in the situation with Xiao Jianhua surfacing,” Xin said, referring to the Chinese billionaire who was recently vanished from his luxury abode in Hong Kong. Xiao is a known financier for the families of the Communist Party elite, and is also the Jiang faction’s top money launderer. “In military affairs, we say you fight your war, and I fight mine. It’s the same in politics: If I bag a very prominent person from the opposing faction, they’re forced to turn honest. Then it’s possible to circle around and deal with the [anti-Falun Gong] legal interpretations,” Xin Ziling said. 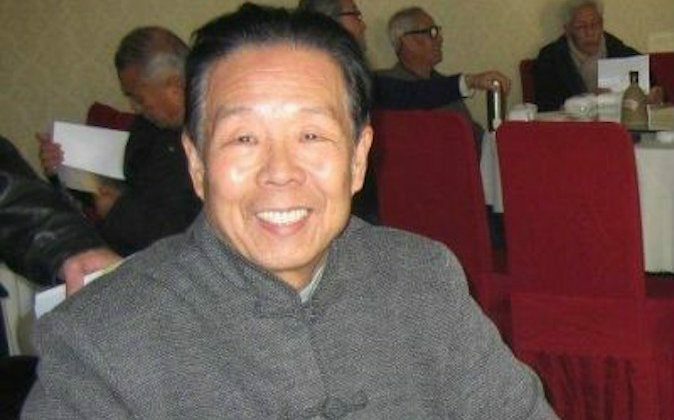 Xin believes that Xi Jinping and Wang Qishan can only be sincere with their anti-corruption campaign and other reforms if they bring Jiang Zemin and his right-hand man, Zeng Qinghong, to justice. Xin Ziling’s views on elite Party dynamics in China are informed by his channels to moderate voices in the top Chinese leadership, he says. He has long been known as a reformist voice in the Party establishment, and for years has periodically spoken to media independent of, and sometimes seen as critical towards, the Communist Party, without suffering retaliation. This is unusual in China, where the speech of retired cadres is often carefully circumscribed, particularly when it comes to speaking with foreign media, let alone outlets that hardline elements in the Party regard as hostile. Jiang Zemin was Chinese leader from 1989 to 2002. Operating through his political faction, he continued virtually unchallenged as the regime’s de facto boss for another decade. Jiang’s reign was marked by rampant corruption and kleptocracy, and he also oversaw one of the most violent political campaigns in contemporary China, with his nationwide persecution of Falun Gong, a spiritual group that numbered between 70 and 100 million by the late 1990s, according to official and Falun Gong estimates. Xi Jinping has been seeking to eliminate the Jiang faction and consolidate his control over the regime since coming to office in 2012. But because Communist Party power struggles are fraught with danger, Xi and Wang have been “consolidating at each step, and have refused to show their hand unless they are guaranteed victory,” Xin Ziling said. The capture of Chinese businessman Xiao Jianhua, a crucial collaborator with Jiang’s people, is a sign that the Jiang-Zeng problem will be “completely dealt with,” Xin said.